How can we develop a mold with unique de-molding capabilities to disguise the exit points of the molding rods and create interior voids which increased the strength of the chair? And how will that drive the final shape of our chair? Our first attempts at molding the chair focused on using gravity to create convex voids and avoid concave draping, which we coined “the hammock effect.” We knew that the weight of the resin soaked fabric would allow us to simply drape the wet crochet over a form and it would stretch and cling to the shape of the mold. The mold was created using a combination of techniques with the highest consideration of the de-molding process. We CNC'd foam insulation to create the general shape of the chair’s back and seat which could be removed out the back of the chair when dry. 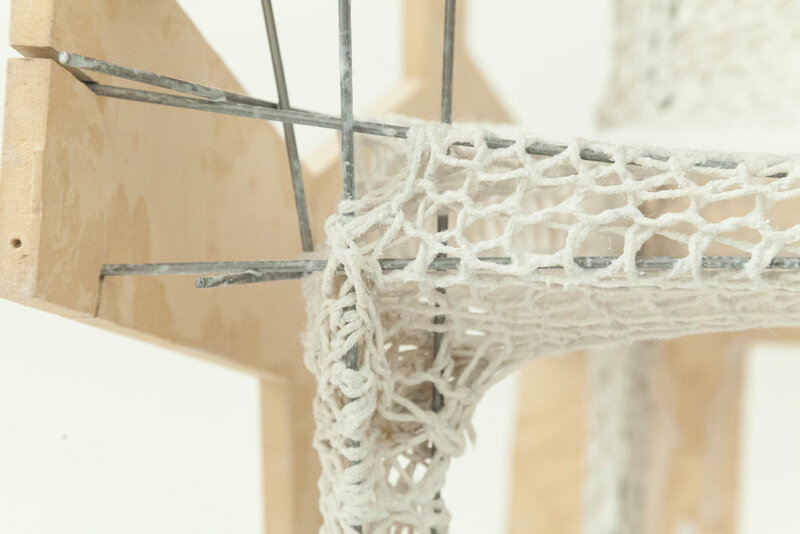 The legs were achieved by threading metal rods through registration holes in the foam and the crocheted leg was stretched around them to give them volume. The resin cured on the chair in a reclining position (appx. 20 degrees) in order to get this "windswept" look along the back edges. This method looked beautiful and full of interesting lacey details, but could hardly hold itself up due to the incomplete volumes which allow for massive racking when tested. Because the completed volumes of the legs were the only stable parts from our first mold, we re-grouped to figure out a molding method that would allow us to create completed volumes for all parts of the chair form. 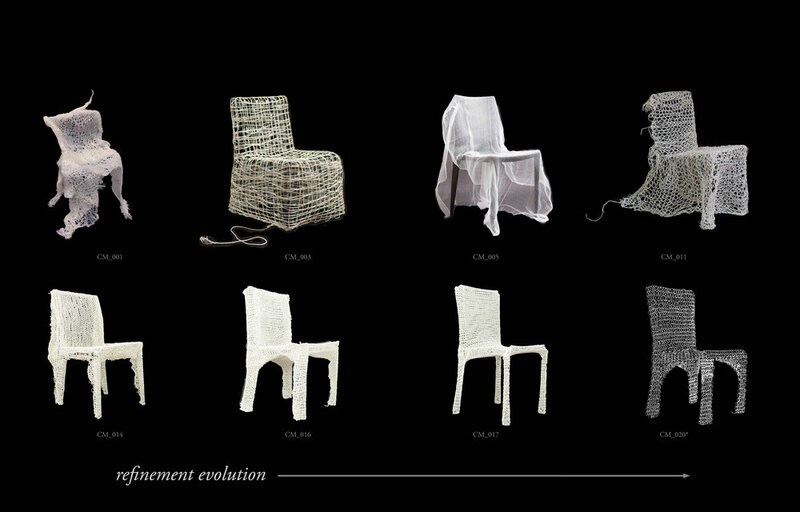 We adopted the method of using metal rods to stretch the crochet into completed volumes that were taut on the front faces of the chair and draped by gravity to the bottom and back in order to force the crochet into the desired shape that was both aesthetically desirable and structurally beneficial. We CNC’ed an MDF scaffolding system with nearly 50 registration holes that would capture the lines of the form we were pursuing once threaded with metal rods. At some point we questioned whether we were making a chair exoskeleton or a medieval torture device. Once the resin had cured, the rods slipped out of the MDF frame for demolding with a simple twist of the rod using vice grips. Once removed, the molding technique was obscured because the rods were demolded through the natural holes in the crochet. This method was great for forming charming wobbly shapes at the back of the legs and draping arches that buttressed the legs. The cured chair was impressively strong and able to hold up to 125 lbs. But the crocheted form was a bit too loose in some areas, too bulky in others, and we thought we could still improve the aesthetics and the loading bearing capacity of the chair by slightly gauging the size of the crochet pattern. 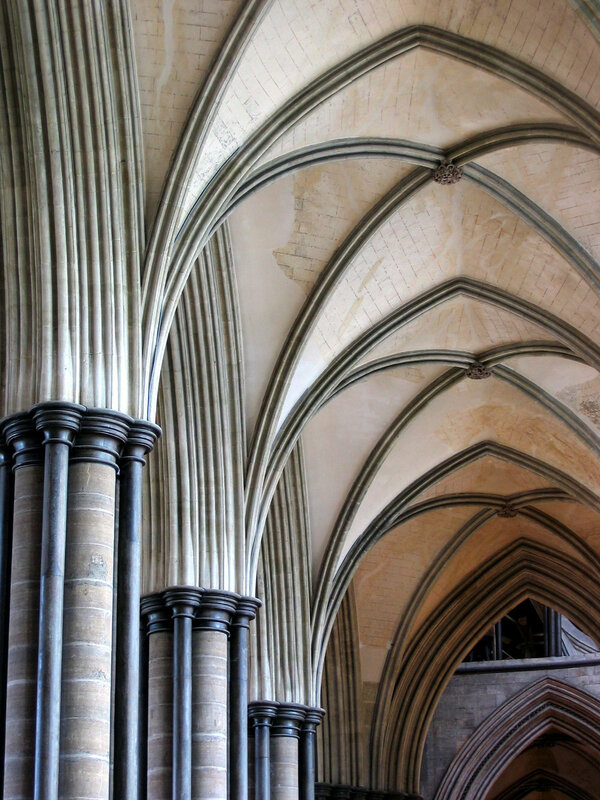 We looked at the arches of Chartres Cathedral and Gaudi's Sagrada Familia to create extra strength in the seat and legs. Two crossed rods below the seat pushed up into the extra roomy crocheted seat to form arches extending from 2/3 up the legs into the seat. This became a crucial source of strength that allowed the chair to hold at least 145 lbs. It was a drastic improvement, but we still thought we could do better. The rod system has pros and cons: its great at allowing us to create enclosed volumes while still being able to remove the mold. But the rods created gaping holes in the material that could look askew, ugly or strained. For this round, we used the exact same MDF scaffolding as the previous round, but tightened up the crocheted form and tinkered with the positioning of our rods. With these small changes the chair changed dramatically. In the end, the crochet pattern was too tight for the mold and we struggled to thread the rods correctly and evenly while it was dry. Once wet, the crochet is entirely unwieldy and it is a race against the clock with the resin so we had to adjust our resin application. Our new casting method was to erect the dry crochet on the molding rods and apply the resin with rollers, which was successful as a procedure, but not as a final process. Unfortunately rolling on the resin created really uneven results: some areas were over saturated and became plastic-y. Other areas were accidentally skipped altogether. The bare patches of the crochet really depreciated the strength we had previously achieved. However, this method led us to believe that in an industrial process the entire chair could potentially be dipped in resin in order to fully saturate the interior of the voids and the center of the joints.